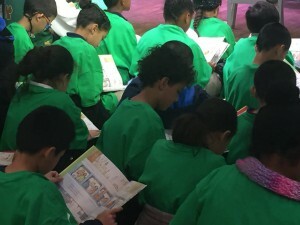 ReadBoston launches Boston Celtics Read to Achieve program partnership! 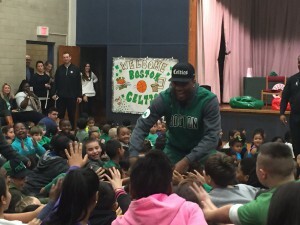 In October, ReadBoston launched our school-year partnership with the Boston Celtics’ Read to Achieve program. Read to Achieve encourages kindergarten to 5th grade students in the Boston Public Elementary Schools to complete monthly goals of reading 20 minutes per day, 5 days per week. These reading goals encourage family engagement and match the national benchmark for achieving reading success. 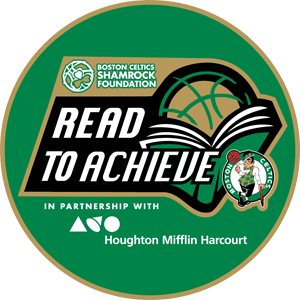 BPS students who participate in the Read to Achieve program receive incentive prizes including Celtics-branded school supplies, tickets to basketball games, and special events with Boston Celtics players. Students are also encouraged to complete reading comprehension assignments for additional prizes. The school with the highest participation for the school year will receive a new library!  This year the Read to Achieve program will serve over 3,800 Boston Public Elementary School students in 12 schools throughout Boston. To kick-off the program, second grade students from the Harvard Kent Elementary School in Charlestown were invited to the Comcast SportsNet New England studio in Burlington for a peek behind the scenes. 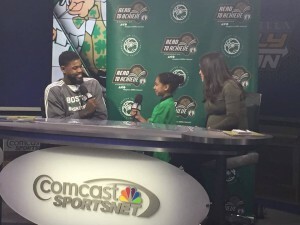 Boston Celtics Amir Johnson, legend Dana Barros, Comcast Sportsnet reporter Abby Chin, and Maggie DeMont of Houghton Mifflin Harcourt read the book My Two Blankets by Irena Kobald, and students had a chance to play reporter. Everyone had a great time! The students at the Roosevelt K-8 in Hyde Park had the highest reading participation for the month of November and won an in-school assembly. 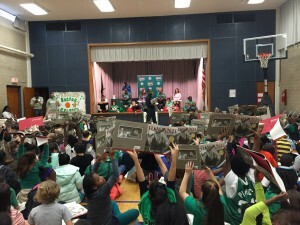 Boston Celtics player Marcus Smart, legend Dana Barros, Celtics dancer Victoria, and Rima Hyder of Houghton Mifflin Harcourt read Jumanji by Chris Van Allsburg. Everyone received a copy of Jumanji, and Houghton Mifflin Harcourt donated 500 new books to the Roosevelt K-8! We’re off to a great year of reading success! ← Parent Literacy Leadership Initiative kicks off its fourth year!